Includes 7-1/4" Magnesium Hypoid Saw - 5377MG-R, Carbide-Tipped Blade - A-94530, Hex Blade Wrench - 783204-6, Operating Manual. Large bevel capacity with positive stops at 22.5°, 45° and 51.5°. 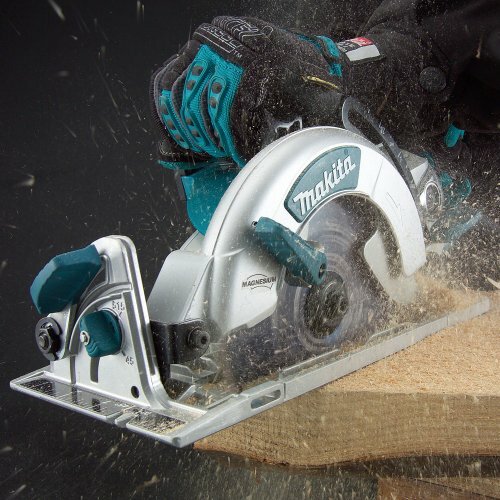 all the best things from the older makita hypoid, plus all new features and magnesium for reduced weight. every framing saw needs to bevel to at least 50 degrees. well this one goes beyond that and bevels to 51.5 degrees. every saw needs a sky hook. i like the top handle too. this saw is so sweet to use. it's so powerful AND lightweight. i like using this one over the bosch. that cord thing bosch has going is good in theory, but my cords don't fit it. it's a hypoid so you never have to change the oil like you have to on worm drive saws. it has a lower blade guard, so it wont hang up while cutting shims and bevels. "TOOL XPERT" Pretty much covered it, cutting PT wood is so smooth. I'll post again when I have the diamond blade on it, but so far I'm extremely happy with it. This is a really good hypoid saw. 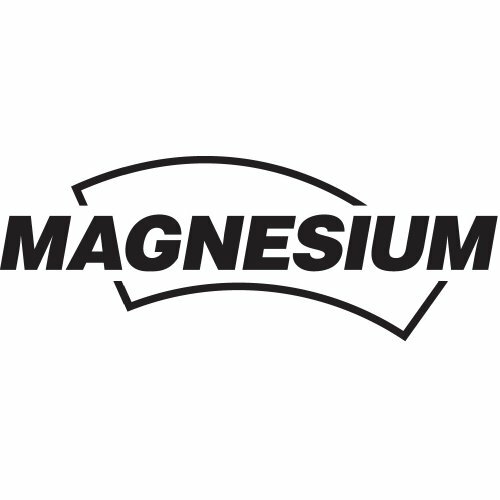 The magnesium makes it very lightweight, it's got an integrated rafter hook, the over-sized adjustment handles are easy to use, the lip on the blade guard doesn't catch or grab even on angle cuts, 15 amps is plenty of power and the balance is good. So why only four stars? 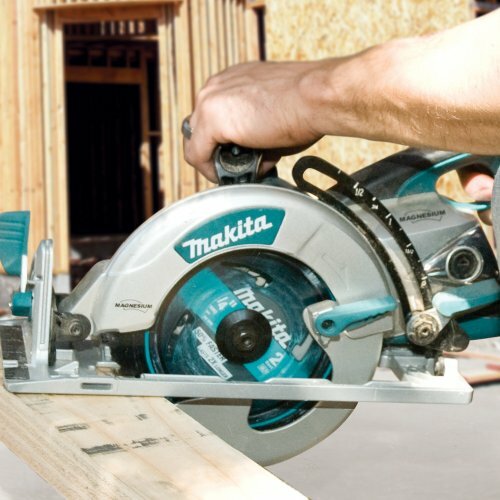 I'm a bit tweaked that this saw doesn't come with a rip fence. There is a slot for a rip fence and other Makita saws I've purchased have come with a rip fence. If it came with the fence I'd give it five stars. This looked like a high quality tool but the one I received in the mail came in a banged up box, poorly packed, and had clearly been sitting on a shelf gathering dust for a while. When I saw it's condition I looked up the age of the saw by the serial number and found that it was over two years old. I returned it and got a full refund, then bought one locally instead. Went out on a limb and bought this saw without even seeing it in person. Since then I have been doing some serious framing and I'm pleased with the results. But don't trust the presets for the depth gauge and bevels. Not 100 percent accurate. 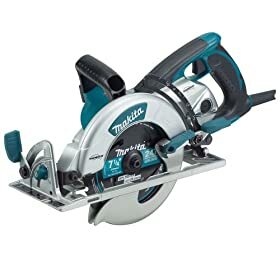 I bought this saw to cut all the pressure treated lumber for my deck since my other tools (except handsaws) were not going to be up for the task. I picked this saw over the others available based on reviews from several woodworking sites. Every review site seemed to like a different saw but in general all agreed that the Skil was the best overall. I passed on competitors models for several reasons: well reviewed Skil saws were too heavy and had overlooked faults that bothered me. The Dewalts, Boschs, etc all had quirky features. The Ridgid was excellent but had a diamond arbor which limited the blades you could use. The Makita was new and it replaced the outgoing model which was well received so I went with the 5377MG. I'm hesitant to call the saw underpowered because it's more powerful that my other equipment but I would bet that the heavier saws have more power when the saw is pushed hard. Always get the black A-94530 blade. It's sharp, lasts a long time and is coated to prevent binding. The screw is black and matched that older style Makita saws not the newer padded blue screws. Do not buy the skinny 164095-8 rip fence by mistake. Note: if you buy this saw in the 5377MGX version, you'll receive a ballistic nylon blue carpenter's belt instead of a case. 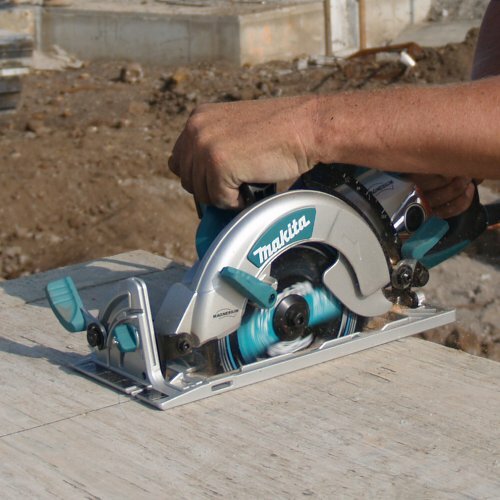 There is also a Makita 5477NB now available that is a stripped down version of this saw. I'd love to know what parts that other guy had magically fall off, because I can't find a single fit or finish flaw with mine. This thing is built like a tank, but doesn't weigh you down too badly. I'm a bit concerned about the longevity of the lower guard spring, but for right now, it works fine. I chose this over the Bosch worm drive model purely because of the lack of need to drain and flush any oil out of the gearbox with kerosene, and I have no regrets. It ploughs right through wood, doesn't jump around when it starts up and has a really steady base. Not sure what else you'd need a circular saw to do. I was thinking that this was going to be too heavy for most of my applications, but it is NOT! You don't have to be The Hulk to use it. It cuts through wet lumber like butter, keeps a very straight line without the guide. It looks like a 57 dodge or chevy. It has the beam hanger (if you set it on ground it rolls over) which is awesome. I freaking love this thing! Nice thin kerf blade comes with it. I don't think I'd go with the other top brands for this, it is super light comparatively.